SixTAY Days of Writing Challenge! I am proposing a challenge to each member of TAY who would like to participate. From the dates of June 1st to July 30th—a span of 60 days—I challenge each of you to write and publish one article on TAY every day that you are able! That sounds scary, but it is possible, and you can do it! 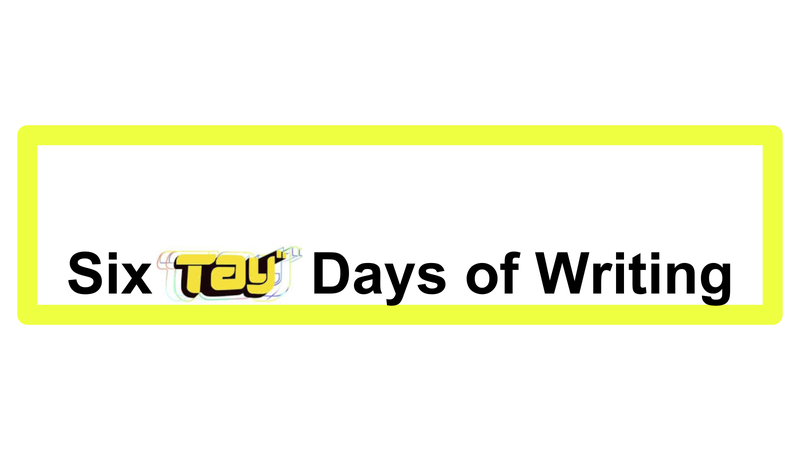 There is one formatting rule: Tag each article you write as part of this challenge as “SixTAY Days of Writing.” That’s it! It’s more important to write something for this challenge than it is for that thing to be super long or brilliantly written. Don’t be embarrassed about making something that you aren’t 100% happy with. Just try to focus on writing about topics you’re keen on and that passion will come through. As long as you respect others, you are absolutely welcome here! Please read this guide on how to get started writing on TAY. I get it. Life is busy. This is not an “all or nothing” challenge. If you’re able to write even 20 articles in a span of two months when you usually write eight (or none at all! ), that’s still a very impressive accomplishment! If you honestly run out of time for one day, publish what you have if it makes sense on its own. If you’re going to write at your usual rate, you can just carry on writing how you want separately from this challenge. And it’s never too late to jump in, even in the last week! As far as the subject matter, TAY mainly focuses on video games and anime, but don’t let that constrain you! If you have a story or thoughts on any topic you think is worth telling, then go for it! Bonus points if you can tie it back to one of TAY’s main interests, but it’s not a prerequisite. I recommend keeping a journal of some sort to write down ideas for articles. Just jot down something interesting that you think you could write a few paragraphs about. I’ve included a few examples of types of articles you could write in the comment section below. Absolutely! If you already publish something weekly, you’ve already got your idea for eight articles! TAY already has people hosting all of its open forums, so don’t try hosting your own without permission, but you are absolutely free to host a debate as long as you engage with commenters! Feel free to ask any questions about this event in the comments! If you want to join, please say so in the comments, and I’ll add you to a list on this post throughout the event. But you can join at any time just by using the tag! Thanks to Nomadic Dec, SirMarth, DisturbedShadow, and Nior for cutting this down!